Beautifully maintained, single-owner 2011 Sunseeker Predator 115 available for quick sale. 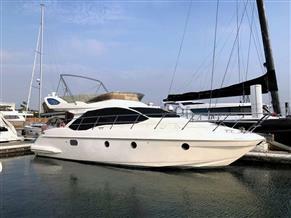 The Seller has a new yacht on the way, and is keen to consider all reasonable offers. Luxuriously appointed in a 5-cabin layout, this voluminous yacht is ready for the upcoming 2019 yachting season. Powered by twin MTU 16V 2000 M94 engines (less than 700 hours per side), she is capable of a top speed of 26 knots. At 10-12 knots, the Sunseeker Predator 115 is capable of 1250nm, making her equally at home for day use or extended cruising. Full-time crew has worked hard to care for this yacht at a very high standard, please arrange your viewing today. Are you located further afield than Hong Kong? Please don't let that deter you from viewing this luxurious sport yacht. Hong Kong is extremely convenient for visitors, and one of Simpson Marine's friendly brokers will happily pick you up at the airport or your hotel and arrange a viewing of this Sunseeker Predator 115.